The IAM’s message can’t reach everyone’s ears if it’s only spoken in one language. That’s why classes are delivered in three different languages at the William W. Winpisinger Center. 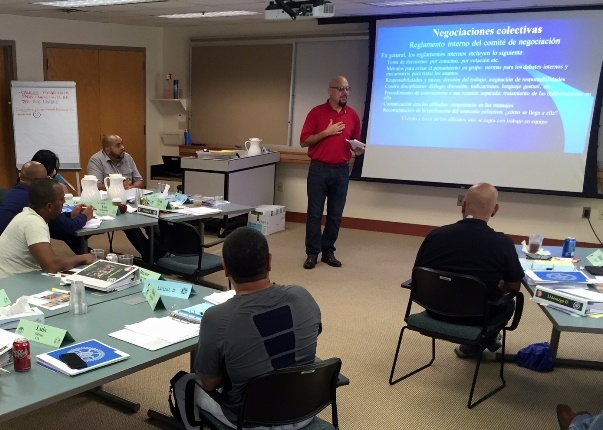 During the course of a single week in July, instructors at the Hollywood, MD training center were teaching classes in English, Spanish and French. Members were enrolled in either the Employee Assistance II program in English, French Leadership I or II, or Spanish Leadership II. Due to the interactive nature of the programs and the intense discussion which often occurs in programs at the Winpisinger Center, many IAM members are more comfortable with the program delivered in their native language of Spanish or French. If you have any questions about the Spanish Leadership Programs or need any additional information, please contact Edmundo Osorio at 301-373-8814 or eosorio@iamaw.org. If you have any questions about the French Leadership Programs or need any additional information, please contact Grand Lodge Representative Gerald Tremblay at gtremblay@iamaw.org. If you have any questions about the Employee Assistance Programs (EAP) please contact Retirees and Employee Assistance Program Director Edward Manhart at emanhart@iamaw.org.